My Necron Codex arrived about twelve hours early, so I’ve been spending some quality time with the new book, building up my new list and enjoying getting back to my first love of 40k. I enjoyed it so much, in fact, that I thought I’d pop along here and share some ramblings with you all! First of all, I think I should share my initial disappointment with you all. Having taken the decision last summer to re-paint my dynasty in Thokt colours, I was saddened to see that they don’t have their own Dynastic Codes (the Necron version of Chapter Tactics) in the new book. I’m sure I’ll live with it, for sure, but still! While I have played with Necrons a few times in 8th, I’ve predominantly been playing with Dark Eldar, so don’t have a wealth of expertise to share as regards what has been good, what hasn’t, etc. I usually prefer infantry-heavy lists, anyway, and will never use so much as a single Warrior because I dislike the sculpts so much. This has been true throughout 7th Edition and remains so now! I don’t have a tremendous range of big Necron models in my collection, truth be told, as while I’ve built a Triarch Stalker, a Monolith, and the like, I’ve never really found it in me to paint them. I think I just love the look of the infantry so much that I don’t really rate anything more. That said, I have been thinking about my options for a few things, and I’m now set on getting both an Annihilation Barge and a Doomsday Ark for my collection. I have the minis for both, naturally, but they’re in some state of partial assembly (and have possibly been sprayed green, my previous colour scheme for these chaps). So I definitely need to get a move on! As it stands, my army is looking decidedly infantry-heavy, like I said, but I do have the Catacomb Command Barge providing a nice centrepiece model for the whole. 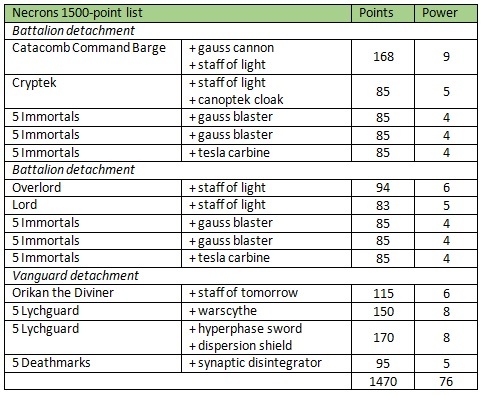 I’ve extended my list to 1500 points, having only been playing at 1000 points for the time being. I do feel that I’m in the mood for some larger battles now, though – especially now that the rules of the game are more firmly in my mind! This would avoid wrecking my list too much, as well as keeping things well within 2000-points. But this is definitely a lot of theory-hammer that I don’t think I’ll be doing much with for the time being. I mean, there’s still a long way to go before I have all of these models ready for battle! I’ve actually got enough points in the main force to swap out that Lord for a second Overlord, which I have been considering, arming him with a voidscythe because S10, AP-4 D3 sounds amazing, even if I have to subtract 1 from the hit roll! I have a “converted” Lord, however, made out of the spare Overlord when I made the Annihilation Barge, so I suppose it would be nice to keep him in for the time being. Reanimation Protocols have had a slight tweak now, in that they don’t work for models who have fled from the unit. Of course, everything is Leadership 10, so things don’t often flee anyway, but it’s probably worth mentioning. Otherwise, though, there isn’t really a huge difference to the meat of the army. Immortals are still pretty much the same solid troop choice, and Lychguard carrying swords and shields have come down a little thanks to the points reduction on the shields. Dispersion shields are a fairly cool addition now, thanks to the Dispersion Field Amplification stratagem, that allows you to bounce back shots fired at them if you roll a natural 6 for your save. It’s 2 command points, but it’s incredibly fluffy, and what they used to do anyway, so I like that a lot! 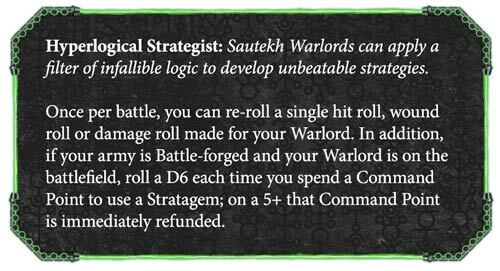 The Warlord Trait, Hyperlogical Strategist, allows me to re-roll a single hit, wound or damage roll once per battle, which I’m not particularly thrilled by as I tend to treat all once-per-game effects with some caution, but the Trait is also the Command Point refund one. As I said, I already have 10 Command Points, and there aren’t a lot of Stratagems that I feel will be key to my battle-plan. 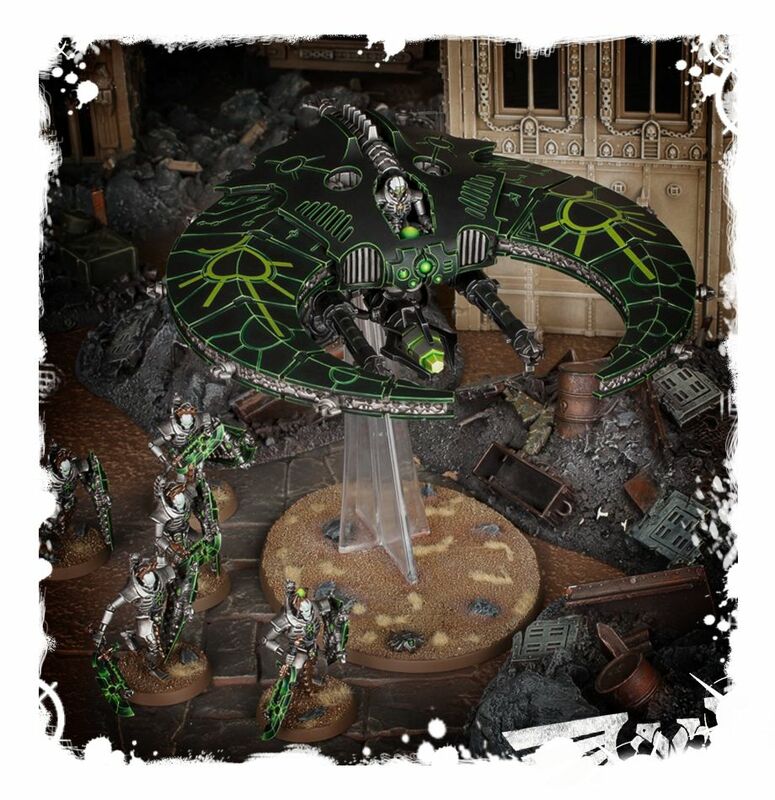 See, a lot of the Necron Stratagems are quite specific as to who they affect, which is nice if you have a good spread of units of course, but it does mean that of the 22 generic Necron Stratagems, I can only use 12 of them. 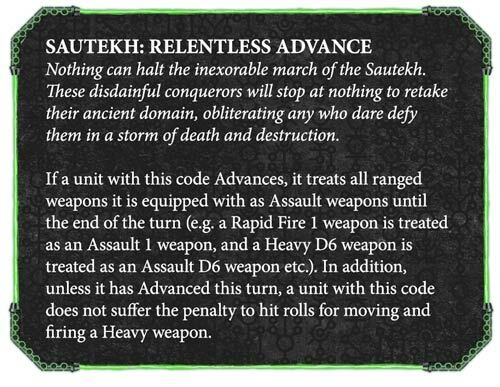 I like that a lot of the flavourful rules of yore are making a return in Stratagems, but some of these are so specific, they would perhaps be as well to have been included as a specific rule on the datasheet of the unit in question. Just my thoughts there! Finally, the Artifact of the Aeons (that is, the Relic) I have chosen is Sempiternal Weave on the Overlord, which grants +1T and +1W. Going back to what I was saying about a second Overlord with the Voidscythe earlier, I think this would be an ideal relic for him, as he wants to get stuck into combat after all. But there is another relic that actually affects Voidscythes, and it might be worth giving that to him instead. But I digress! I’m no strategist, of course, so don’t take this as some kind of amazing hidden secret for the Necrons, but the basic idea of this army is that of a gunline, six squads of Immortals shooting the place up, being buffed by the Lord and Overlord, while Lychguard protect Orikan. The Command Barge is basically a mobile gun platform, and the Cryptek is on hand to repair things as required. If Orikan manages to become Empowered (I’ve used him once, and it happened, so I have a 100% success rate at getting this off!) then his little blob of Lychguard can become more of a mobile threat on the board, hopefully allowing the Immortals to remain out of combat and thus free to continue shooting up the board. A lot of folks have remarked on the fact I tend to avoid the tesla Immortals, which is indeed a curious state of affairs. It’s mainly due to the fact that I’m rubbish at rolling 6s, so I prefer the reliable AP of gauss over the potential exploding dice of tesla. I’ve got some in there just in case, for sure, but I’ve previously run these two five-man squads, rolling 20 dice for shooting, and not getting a single six, no matter what people say the odds should be! I mentioned earlier the lack of any real firepower, but until I venture up to 2000-points and the prospect of adding in those serious cannons, I think I’m going to be reliant on having weight of firepower above all else. This post is getting really long already, so I’m going to call it a day there. All in all, after a first glance through it, I think the Codex is fine – it’s not really making me want to get out there right now and try out all of the amazing newness, as I don’t honestly think a great deal has changed for me. It’s good to have the book, with the options that Stratagems and the like offer for the army – I’ve talked before about feeling out-classed by playing Codex vs Index armies. Definitely nice to have, anyway! Previous Previous post: Drukhari Codex Previews: Wyches and more!